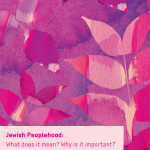 These impressive achievements position us in a promising place for engaging the Jewish educational system in integrating Peoplehood themes into the existing program and curriculum. We have no illusions as to the complexity of this challenge, but believe that the creation of concrete tools and programs can assist in opening doors. In the process we also hope to turn Peoplehood education from an abstract conceptual field into a practical and concrete discipline. Our plans for the coming years is to shift from the development of the tools to their dissemination into the Jewish educational system. We will develop tailor-made training units and modules that can help spread the spirit and message of Peoplehood. And we intend to engage and mobilize the many believers in Jewish Peoplehood to capitalize on the resources and take the message to the educational sphere. This is a good opportunity to thank our dedicated and creative staff, our committed lay leaders, our thoughtful and creative Fellows, our partners at the Commission on the Jewish People of the UJA-Federation of New York and our many friends and partners in the Jewish world. Without them and their support none of this would have been possible. And maybe it is just fitting that a collective project of this nature will be carried out by such a collective group of caring and committed people. Shana Tova to you and yours, to our People and to all humankind.